Memorial Day is a day of reflection where people across the country visit cemeteries and memorials, and our flags fly at half-mast. These days, it is also a day of celebration, and our Memorial Day parades in New York really do set the tone for the day. I find they are a perfect mix of remembrance and happy pride. In New York, we’ll hold around 5 Memorial Day parades in and around the city. The most well-known is the 150 year old Kings County Parade in Brooklyn. War Veterans, accompanied by high school bands and local organisations like the New York Fire Department march along to John Paul Jones Park – at 101 St., where there will be a 21-gun salute. In Manhattan there’s an annual Soldiers’ and Sailors’ Memorial Day Observance on 89th Street and Riverside Drive, with similar events taking place in Queens, The Bronx and Staten Island. Memorial Day weekend also coincides with New York’s Fleet Week – a week-long festival that honors the US Navy, Marine Corp and Coast Guard. This year it’s running from May 23rd to May 29th, 2018. 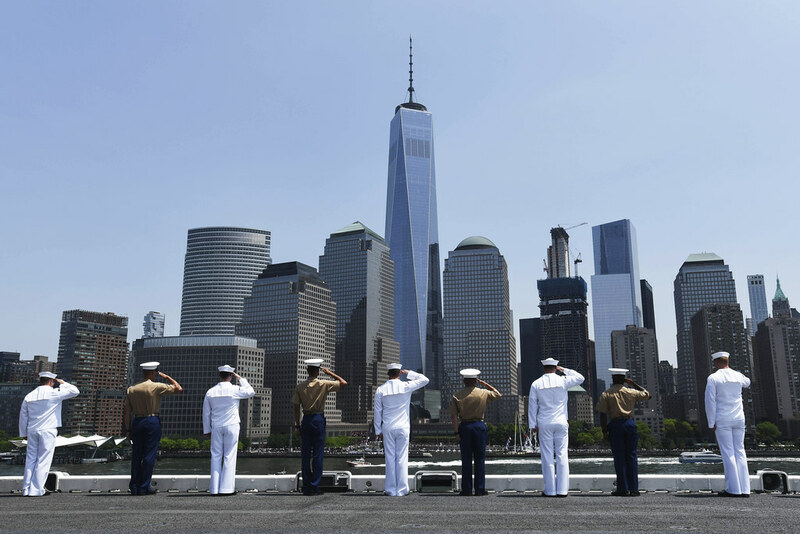 If you visit New York ahead of Memorial Day, you might also see Fleet Week’s Parade of Ships gracefully make their way along the Hudson River. I wonder if gracefully is the right description here, because we’re talking giant aircraft carriers and warships amongst the more historic crafts. You can’t miss it – and the best idea is to head down to any of the parks along the river and take a look. Once they’ve docked in and around Brooklyn, Manhattan and Staten Island, you’ll be able to hop aboard some of the vessels for a tour. To find them, head to Pier 86, 88 and 92. Check out Intrepid – the Sea Air and Space Museum around this time, too. They’ll have a vessel docked there, as well as other special events on throughout the week. Fleet Week is a bit of a treat! It certainly adds an even bigger buzz to our city. Speaking of buzz, the other side of Memorial Day weekend is about the start of summer. One of the great NYC traditions is to get out of town and head to the beach. City-run beaches usually re-open on this weekend and there are a number of incredible beaches around New York to choose from. We’ve highlighted more for you to read about in our Best New York Beaches blog. One of the other New York traditions on Memorial Day is to head to Governors’ Island NYC. Still inside NYC, but quite tranquil by comparison, it’s a perfect place to spend the holiday. You can enjoy the fabulous views of NYC…. from the comfort of one of the island’s hammocks. Bliss! The island usually hosts holiday fun-days and concerts over the Memorial Day weekend. If you plan to stay closer to the city – then you could bag yourself a ticket to the New York Philharmonic Orchestra’s annual concert at St. John the Divine Cathedral. Tickets are distributed at 6pm on the Memorial Day, and it’s then broadcast to the crowds on Pulpit Green nearby. All this as well as the start of the city’s barbecue and rooftop bar events, means that you’ll be spoiled for choice on what to do around Memorial Day in New York City. It’s a fantastic time to visit New York City. Although it’s a federal holiday, the city is open for business, and the team at Gray Line New York will be ready and waiting to show you around town. Hop on board one of our Hop-On, Hop-Off bus tours for the ultimate combination of sightseeing and easy transportation. Don’t forget to check out our Freestyle Pass for the best value entry to some of our fantastic sights – including the Intrepid Museum of Fleet Week fame.